Identify the patient treatment goals using specific and measurable descriptors, ideally in the patient’s own words. This may take some probing or co-creation of the goals to nail down some specifics. But, the patient has to endorse this goal. ...will help me get out of the house with my wife twice per week. ...will allow me to watch my grandchildren every weekend. ...will enable me to plant and maintain a vegetable garden this summer. ...will allow me to return to work full time. ...will help me get comfortable enough to lie down in bed. Present the opioids (or any other treatment for pain) as a test. If they don’t help achieve the specified goals they will be stopped so that other treatments will be tried. (Note: the entire goal may not be achieved, but the specific treatment should move the patient toward the goals). Set up next visit in 4-6 weeks to assess effect of pain medication. 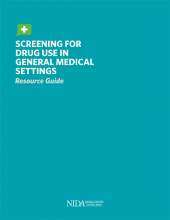 Provides clinicians serving adult populations in general medical settings with the tools and procedures necessary to conduct screening, brief intervention, and/or treatment referral for patients who may have or be at risk of developing a substance use disorder. Easy-to-Read: A new, easy-to-read website on drug abuse from the National Institute on Drug Abuse designed for adults with a low reading literacy level (eighth grade or below).